Here's a nice happy, sunshiny card for these dreary winter days. 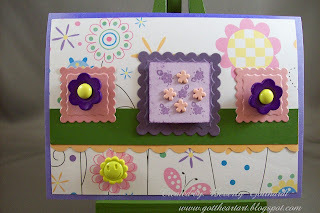 Supplies: Lilac Card Blank 4" X 5 1/2" Halcraft, Papers: all from my stash, Stamps: Will 'n Way- Tiny Textures, Hero Arts-Birthday Messages, Ink: CTMH-Z2161 Petal, Jo-Ann's-tiny flower brads, Favorite Findings-Flower Power buttons, Fiskars-Scallop Sentiment border punch, EK Success 1" circle, 1 1/4" square punches, Spellbinders Nestabilities-Classic Scallop Squares Lg., pop dots. What a cute idea using the little flower brads. I love the whole composition of your card. It's so fun and immediately put a smile on my face. Thanks for joining us at Humble Pie this week. Super cute. Love this idea. Thanks for playing at Humble pie this week. What a cheery card! Thanks for playing along with us at Humble Pie. What a happy card! What fun colors and a fun design too. Great job combining challenges. Thanks so much for playing along with my sketch challenge this week! How very pretty...you really were able to incorporate the 5 colors in a beautiful way. 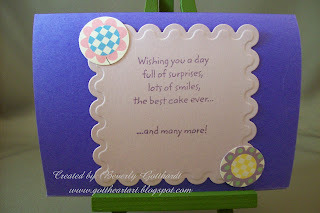 Such a fun & cheerful card!